WEST VANCOUVER — She hasn’t been documenting the steps of her journey, but if the running gods have, this might be the time to remind them that they’ve got a story to tell. Epic in both scope and experience, it encompasses an entire high school life, from an eighth-grader’s first starting line to a 12th grade senior’s final finish line. Focus only on the bookends at the expense of the pages in between, and this becomes a story that has unfolded exactly as it should. If you were there on that day four years ago this month, at the Subway B.C. 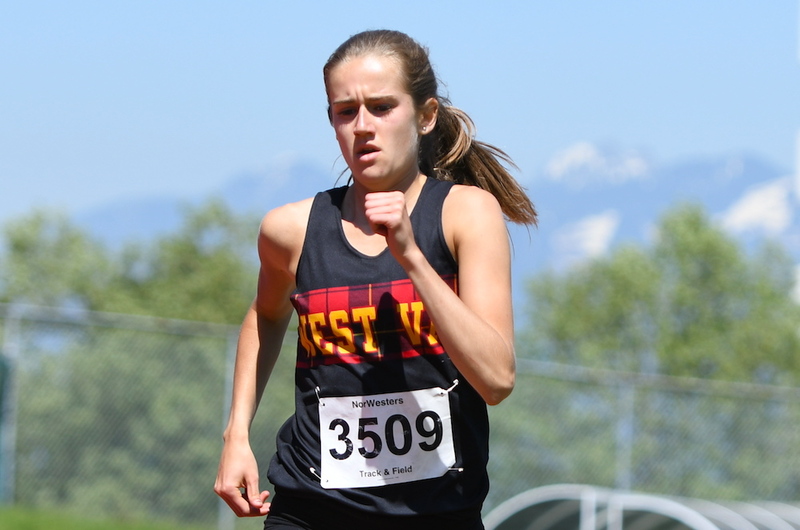 high school track and field championships, you would have seen West Vancouver Secondary’s Megan Roxby announce herself as one of this province’s up-and-coming middle-distance stars after she captured double gold in the Grade 8 division’s 800m and 1,500m races. Based on that alone, you would have expected her to hold serve on that distinction as the faraway graduation day for her Class of 2018 drew nearer. 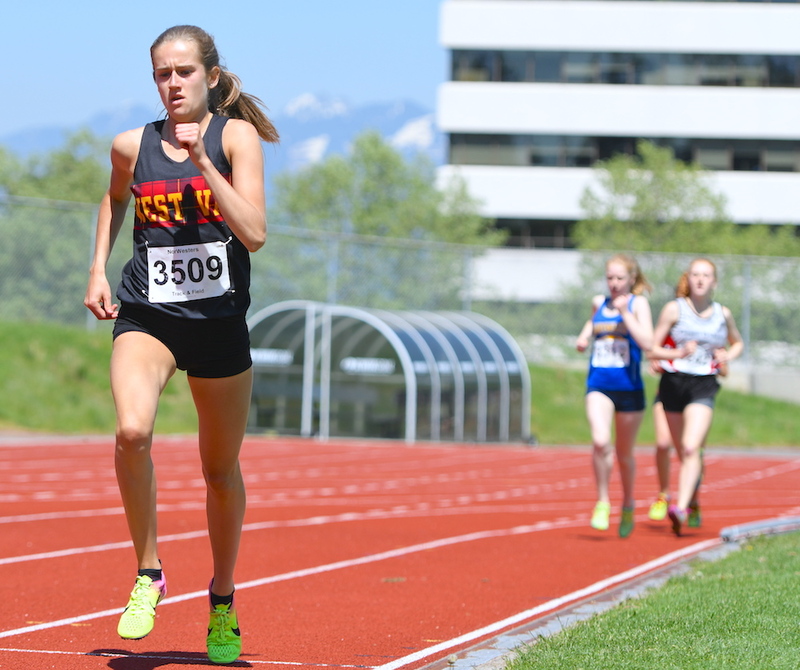 On cue, when the provincial meet opens May 31 at Langley’s McLeod Stadium, that is just where Roxby will be, ready to close out her high school career by lining up as one of the medal contenders in both the senior varsity 800m and 1,500m races. Yet the essence of her story, of course, is what happened in between. It’s about the fear of losing what you love most, but more than that, the reaction to those fears. And in the end, with one adversity piled on top of another, it’s about why that thing inside of you, the thing you hold dearest, is always worthy of your best fight. To understand every last mile of Megan Roxby’s journey, some catch-up is required. Back in October of 2016, while working for The Province and The Vancouver Sun, I was honoured to tell the story of the then-Grade 11 Roxby who had resumed her running career on the North Shore’s cross-country trails just eight months after undergoing extensive spinal surgery to correct a severe case of scoliosis. We’re speaking, of course, about the affliction which results in an abnormal curvature of the spine, and in Roxby’s case, with a 51 per cent curvature, X-rays revealed hers to look like the letter S.
If the odds were clearly stacked in her favour against such an occurrence, there were still no guarantees she would have a running career to return to. Yet if it wasn’t already obvious to those in her close circle of family, friends and coaches, the big reveal was the level of post-op tenacity which had her out of B.C. Children’s Hospital three days after the surgery, and by summer, right back into her running routine. Her purpose was such that by the time last season’s B.C. high school track championship meet had rolled around last June, some 15 months after a tethered cord had been secured to her spine during a 10-hour surgery, Roxby turned in the second-fastest 800m race of her life, clocking a 2:15.97 and stepping onto the podium to win a silver medal. And to even better illustrate her return to form, she ran a 4:39.97 to finish fourth in the 1,500m. Later that summer, during a July race with her club team, the Hershey Harriers, she smashed the personal best she had set in 800m back as a ninth-grader, finishing in 2:15.32. There was officially no doubt. After all she had endured, the new Megan was ready to surpass the old Megan. As if any further proof of her recovery was required, Roxby came out with a vengeance on the trails this past fall and finished fourth in the youth division at the B.C. Cross-Country club championships. That finish punched her ticket to the national championships at the end of November in Kingston, Ont. Yet just to prove that the running gods play no favourites, Roxby began to feel what would later become chronic pain in her lower right leg. “The thought was that it was a tendon and so they were treating it as an alignment issue,” remembers Roxby, who realized it might be something more after completing a shake-out run over the race course with Team B.C. the day before the national final. Roxby, however, could not resist the urge to race. A few days later, after staying behind in Ontario to hobble around and visit a number of university campuses on recruiting visits, she returned home and finally got a diagnosis for her pain. X-rays clearly showed she had been competing despite a broken right fibula just above the ankle. No one is sure exactly when the break occurred. Roxby thinks it may have been in the pre-race jog before nationals, but admits she was feeling prior pain. O’Krane suspects it may have happened at a pre-grad dance in mid-November. “We think it happened before nationals because the X-rays showed that it had already been healing,” O’Krane said before referencing the pre-grad dance to inject some levity into the situation. “Why, if you’re 5-10 you have to wear high heels, I have no idea,” she joked. To everyone in Roxby’s running circle, the injury was devastating, both on its own as a part of her senior year, and as an addendum to her recovery from spinal surgery. It’s this past Tuesday at Swangard Stadium, on the occasion of her final North Shore high school championship meet, and Roxby is five months clear of the day she was told she had a broken leg. A step above her competition, she is a comfortable winner in both the senior 800m and 1500m races. Afterwards, she confirms she will run both races when the B.C. 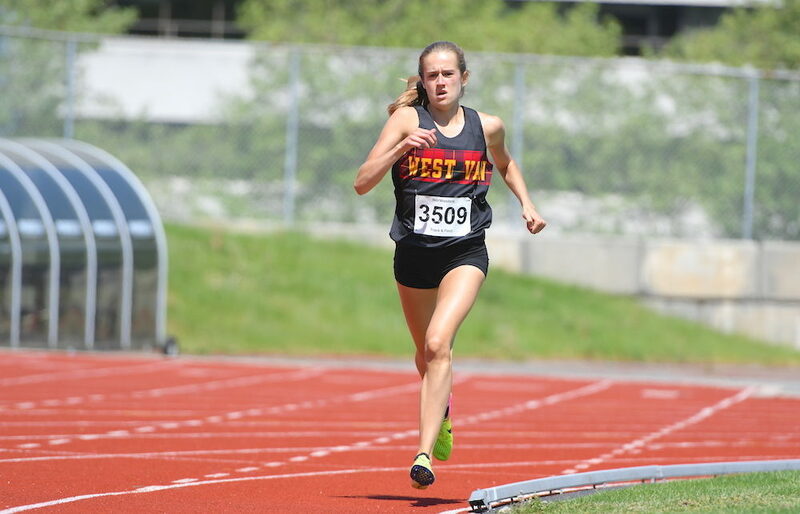 championship meet opens its three-day run May 31 at Langley’s McLeod Athletic Park, fittingly the same venue where she won her first gold medals back in the eighth grade. Beyond all of that, just as a high school career which at times looked like it would never be comes to an inspiring finish, there is a new beginning. And for Roxby, her decision to continue her collegiate running career atop Burnaby Mountain with the Simon Fraser University Clan seems to be one wrapped in kindred connections. West Vancouver Secondary also happens to be the alma mater of both SFU head coach and former Olympian Brit Townsend, as well as Helen Crofts, one of the school great former middle-distance stars. In fact the North Shore connection as it pertains to the women’s middle-distance tradition at the school is both deep and decorated. Olympian Jessica Smith came to SFU from Argyle Secondary, while Lindsey Butterworth, who has become a personal mentor of Roxby’s, attended Handsworth Secondary. Ask Townsend about Roxby, and what stands out above her times on the track are the answers she has already provided to so many of the intangible questions. “She has had a lot of challenges, dealing with injury recovery and rehab,” begins Townsend, “and it’s made her a much more mature athlete in so many ways. 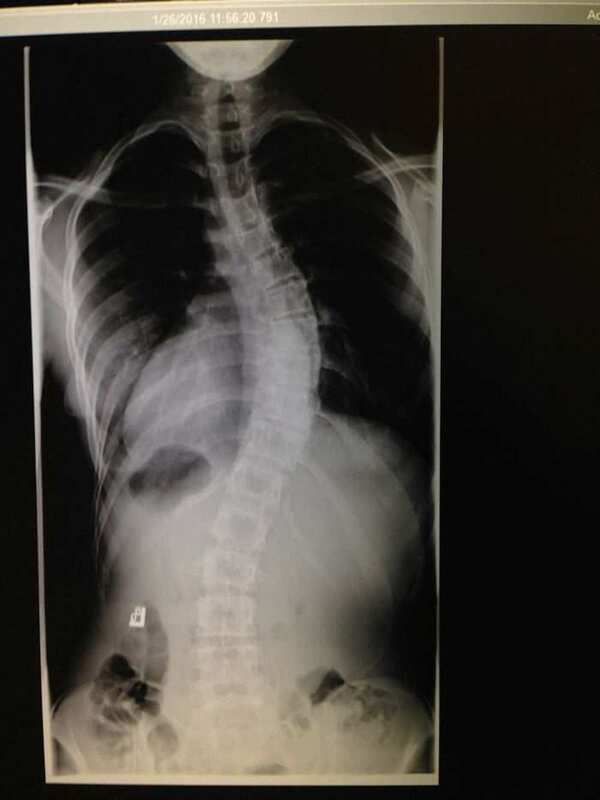 Plug the dates into one of those on-line duration calculators, and you will discover that, smack dab in the middle of her high school running career, Megan Roxby had 650 days between her surgery to correct spinal curvature and her official diagnosis of a broken right leg. It is a period of time which has defined her tenacity. *Last summer, less than a year after resuming her track career post-spinal surgery, she ran a personal-best 2:15.32 in the 800m. *This past November, with a broken leg, she completed the 4,000m course at the national championships. Ask Roxby about it, referencing her prior experience with surgery for scoliosis and the doubt it cast over her running career, and you’re convinced that this is a student-athlete whose desire to run comes from a different place. Now, with her high school career approaching its end, the young girl who had every reason to give up on her sport is able to look back on it all with scholarly wisdom. “I think it taught me that I am mentally strong,” she begins. “It taught me that I can deal with the things that come my way and that I can get back up when I get knocked down. I think I was maybe able to look at having a broken leg a little differently. The running gods have told her story and there really seems to be no doubt. In between the bookends, within the details which have come to define both her and her love of running, Megan Roxby has shown us all why we fight for the things we love most.